This room is packed with a good share of returnees and newbies. 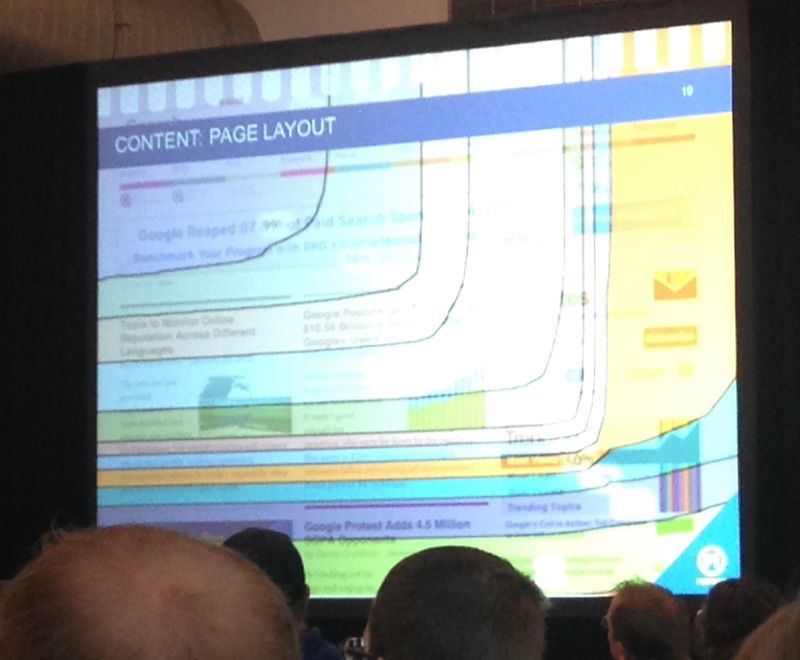 We’re told this session is going to cover everything you need to do to rank well in the SERP … mm hmm. This session is fast and furious, and so is this liveblog. Here we go! Tober promises to explain the Google algo in detail in the next 90 minutes (his ranking metrics presentation is set to the Iron Man theme). In the recent study they’ve done they compared ranking factors of 2013 to 2014 and what they are seeing more commonly across top ranking sites now vs then. The number of internal links to pages; pages in the site that have targeted and well thought out internal links will sometimes outrank pages in the site with an inflated number of internal links. You should still optimize for the flow of your link juice through the site. Sometimes Less is More. In the past the feeling was a little “yeah, content is important, I should have some”. Whereas now, it’s more like “Yes, you need to have content and your content needs to be optimized.” Marcus says they have noticed that the number of characters and the overall length of content has increased across top ranking sites compared to a year ago. Not only is it important to have more content, but you want to deliver a better user experience because the user’s expectation is higher than it was a year ago. When writing your content you want to make sure to use Relevant Keywords and Proof Keywords. Relevant Keywords are the words and phrases that are relevant to your topic and are commonly used by other competitors. Proof Keywords are additional common words that aren’t necessarily ‘relevant’ but they were also found across the top ranking sites. Use synonymous keywords through out the content; don’t just reuse the same keyword phrase over and over again. The readability of the content (Fleisch reading ease) is a factor so make sure to check this when creating content. Remember that the Panda algorithm focuses on the quality of the content on your site, so you want to have high quality content. Try to become holistic on your topic and become the best on the topic. There was a high correlations with social +1s and Facebook shares among the top ranking sites that SearchMetrics looked at. The takeaway of this is that good content is shared more often, so create good content that people will want to share. Backlinks and their quality still matter — get good links from good sites. Brands might not always have more “fresh” links but they have the brand awareness, so they typically rank high, and then the sites with a high number of “fresh” links were found to be ranking immediately after the brand. When analyzing desktop vs a mobile environment, only 64% of the sites ranking on the 2 platforms were the same in the SERPs. This makes it easy to say that mobile is ranked somewhat separate than desktop in the results with a fair amount of overlap. The amount of time on site and the click through rate seem to be more important than the Bounce Rate according to their study. This makes since seems how Bounce Rate can vary depending on the site, industry and information the user is seeking. Marcus says that SEO shouldn’t be defined as Search Engine Optimization anymore, but it should be Search Experience Optimization instead. With that, Marcus closes and Danny states a basic observation -the search algorithm is supposed to mirror what humans actually like. Humans typically don’t like junk, spam or bad sites so why should those types of sites rank higher than the quality sites that people actually do want to see. Good food for thought. Marianne starts with a funny statement about how UX folks are annoying. I think to myself, “Really? More than SEOs to an IT team?” (ha ha ha). She states that searchers are growing increasingly more lazy since search has become easier. Search has improved by the searchers behavior hasn’t improved at the same rate. Historically, UX and SEO have developed on separate tracks when in fact they should have been joined all along. Back in 2011 when Panda started, this was the first real clue to the industry that UX was important in the SERPs even though it had been murmured about for ages. CTR is impacted by the SERP and how users decide on what result to click on. Users scan results and because of this “lazy” behavior, Google decided to shorten the length of Titles they display and increase the font size in order to make it easier for those scanners. Engagement: Users are not inclined to scroll on a home page unless induced to do so. They like to see the usable content above the fold. Maximize the space of your webpage above the fold. Proto-typicality put simply means – Don’t put things in odd places, or call them odd things. Don’t get fancy and put your main global navigation at the bottom of a long page, or hide the search button in an inconspicuous spot on the page if your site has a high interaction with the search. Don’t reinvent the wheel here folks. If it ain’t broke, don’t fix it. Visual Complexity is something else to think about. This is the ratio and relation of images to content. If a site has too much visual complexity it is perceived as not useful. Keep the ratio within reason to avoid any issues. Navigation should be put where it is supposed to be and where users are used to finding it. Don’t have too many different types of navigation and make the overall navigation simple and easy to use so that users can find the pages they are looking for. A popular design nowadays is having the large Hero graphic across the middle of the page, but according to Marianne, these don’t always work for UX. You’re taking away an opportunity to make the site useful. Keep your “Click Distance” to task completion to only a few clicks. Don’t make people go to extra pages just to complete something that can be done in 3 pages. Also, think about the overall depth at which you bury your content. This use to be big a few years ago and Marianne still thinks it’s important enough to mention – don’t bury your great content 7 or 8 directories deep in the URL structure. This could lead search engines to believe the content is less important. Take a look at what content you have and what is presented to users. Do a Content Audit and assign each piece of content to a person where they have to either Keep it, Kill it or Revise it. Remember that dense, subject specific content is preferred over “thin” content – by users and the engines (Panda anyone?). Hummingbird also needs to be considered when creating or revising the content to make sure synonymous phrases, semantic search and the like are supported. Consider setting “scrolling” as an action to factor into the Bounce Rate of a page, because after all, scrolling is a form of engagement. Brown opens by quoting Edward Tufte: “correlation is not causation but it sure is a hint.” He then advises us to look at correlation studies as HINTS, and not as actual ranking factors. Links: they’ll still be around for a few years but Google is trying to figure out how an expert user would say this particular page matched their information needs. Think about this for a second. There are things we know about and can easily guess that they may or may not become more important in the ranking algorithm. Then there are things we don’t know that may one day become important. The important thing is to just pay attention and be smart about the competition. Know what is working for a set of competitors and then move towards that target. Hummingbird requires us to retest all previous SEO assumptions. You now need to optimize content around entities and relationships. Furthermore, every site has its own set of success factors. Know your competitors and what those factors are. Final takeaway: SEO is going to be harder, and SEOs will be in demand for a long time. You covered all important & effected Google factors which are not easy to find in any other post. Hope you will share more informative information. Awesome work!! SEO is about ensuring your content generates the right type of signals. Search engines reward pages with the right combination of ranking factors. The content or webpage with the highest value is placed at the top of the search engine results for internet users. Very informative post. There are many factors which are responsible for affecting website’s ranking in search engine. Some of the most important as well as well-known SEO ranking factors include content, url structure, link popularity and social signals.